Cover produced for the 25th Anniversary of the Red Arrows Cover depicts the famous diamond nine formation and the Hawk's of the Red Arrows overflying Biggin Hill in 1987. Cover also depicts the Red Arrows Squadron badge. Cover bears 22p green welsh defin cancelled with BFPS 2205 for the 40th Anniversary of the First Flight of the Canberra on 13th May 1989. 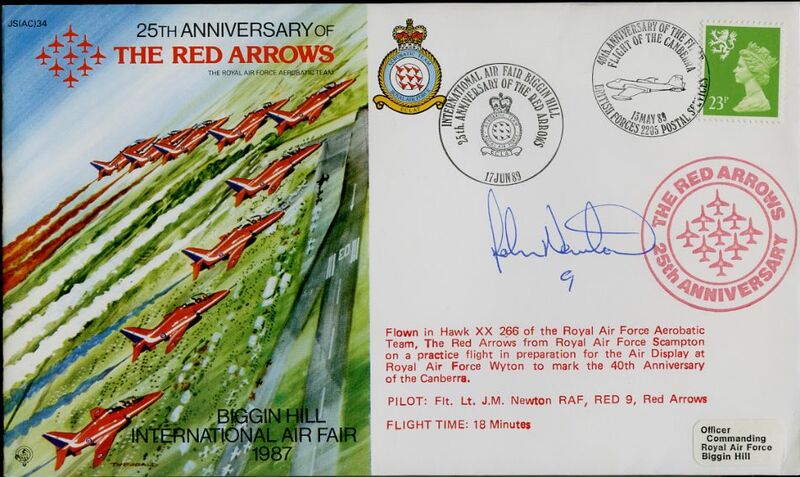 Cover bears red Cachet for the Red Arrows 25th Anniversary and cachet for the Biggin Hill Air Fair in 1989. Cover has been flown in Hawk XX307 of the Royal Air Force Aerobatic Team, The Red Arrows from RAF Scampton on a practice flight in preparation fpr tje Air Display at RAF Wyton to mark the 40th Anniversary of the Canberra. Two of those original aircraft remained in service until 1995, being used for groundcrew training at RAF Scampton. The RAF sold one to The Royal Jordanian Historic Aircraft Flight and the other to a private buyer in South Africa. In 1957 The Black Arrows were increased to nine aircraft. These were supplemented in 1958 by an additional 13 aircraft from other squadrons in order to perform a 22 aircraft loop and barrel roll at the Farnborough Air Show. This is the greatest number of aircraft ever looped in formation and remains a world record to this day. The RAF were soon to realize that training aircraft were a much cheaper option to operate than the Lightning. The Squadrons, afterall, seemed to be spending more time at airshows and less time flying operational sorties. The Red Pelicans were not without their rivals and in that same year a five ship of yellow Gnats, known as The Yellow jacks, were formed at RAF Valley in North Wales by Flight Lieutenant Lee Jones. The Folland Gnat was the RAF's advanced jet trainer and its speed and agility made it the perfect machine for formation aerobatics. The following year Jones formed the official RAF display team with a seven ship of red Gnats and called them The Red Arrows. Initially The Red Arrows were based at RAF Fairford in Gloucestershire which was operated by CFS. The team was equipped with a total of ten Gnats although they continued to display seven until 1968. Each had its own three colour smoke generation system and a distinctive red, white and blue colours scheme. In that first year The Red Arrows performed 65 displays in the UK, Italy, The Netherlands, Belgium and Germany. In the nineteen sixties much of the Central Flying School were located at airfields around the Cotswolds in the heart of England. It was there that the Team remained, moving from Fairford to Kemble, near Cirencester. Although the public have always known them as the The Red Arrows their official name is The Royal Air force Aerobatic Team (RAFAT). This is the title that appears on the Squadrons crest together with the diamond nine and the motto Eclat, which means brilliance. When the team was first formed the original badge depicted seven red Gnats in Vulcan formation superimposed over the RAF roundel. Since 1968 The Red Arrows have performed as a nine ship display team and from that time the Diamond Nine shape has been their trademark. The 1000th show was flown in the summer of 1977 at Greenham Common. Nine years later the 2000th display was achieved in front of holiday crowds at Bournmouth sea front. The 3000th display was performed over the estuary at Dartmouth in August 1995. The Team has always fulfilled its role in promoting a positive image of the Royal Air Force and as an aid to recruiting, but more recently they have been called upon to promote the British Aerospace industry through displays at home and abroad.